Ada soalan mengenai Melia Sinai Hotel? 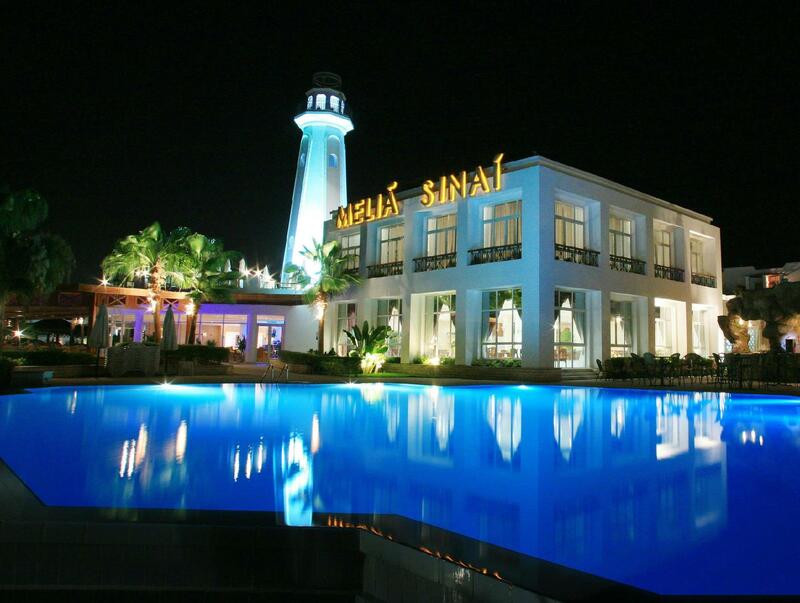 Sama ada anda melancong atau ke luar kawasan kerana kerja, Melia Sinai Hotel merupakan pilihan penginapan hebat ketika melawat Sharm El Sheikh. Pusat bandar hanya 15 KM jauhnya dan boleh sampai ke lapangan terbang dalam tempoh 10 minit. Pelawat yang datang ke hotel boleh melawat tarikan utama di bandar ini seperti: SOHO Square, Lapangan Terbang Ophira - Sharm El Sheikh, Jora Tours. Kemudahan dan perkhidmatan yang disediakan oleh Melia Sinai Hotel memastikan penginapan yang menyenangkan bagi para tetamu. Hotel ini menawarkan pelbagai kemudahan di lokasi untuk memuaskan hati tetamu termasuk yang arif. Hotel ini mempunyai 197 bilik yang sangat cantik, setiap bilik dilengkapi penyaman udara, bar mini, beranda/teres, telefon, TV satelit/kabel. Kemudahan rekreasi hotel, yang termasuk seperti tab panas, pantai peribadi, pusat kecergasan, sauna, kolam renang terbuka direka untuk anda melarikan diri dari masalah dan bersantai. Temui gabungan yang menarik antara perkhidmatan profesional dan pelbagai kemudahan yang ada di Melia Sinai Hotel. Tetamu yang berumur 12 tahun dan ke atas dianggap sebagai orang dewasa. There is no doubt that my choice of this hotel was the worst choice I have made during our two-month summer trip. The reasons were as follows (I stayed with my wife and daughter): 1) Bad location: Quite far from Naama bay and Old market. Although they have shuttles several times a day, it's somewhat pricy (6-10 pound for one way per capita) and often being canceled without any explanations and apologies. 2) Poor cuisine choice: There is not even a single restaurant and grocery store nearby the hotel, and of course, the restaurant inside the hotel is way expensive when considering the quality it offers. Without an all-inclusive plan, you will have to waste additional hundreds of dollars in order to pay for your meals and drinks during your stay. 3) Money greedy staff: Without Wifi connection, it's hardly possible to get out of this inaccessible land. After I decided to check out there, their posture to me totally changed. Without any explanation, they canceled the shuttle bus, and therefore, we had to arrange a taxi to Naama Bay with paying $20 by ourselves. They were also really inflexible to our mistake which I made when I made a reservation. I mistakenly booked a room for single person instead of for three. They didn't mention anything about my mistake, but after I modified our stay from 6 nights to just 1 night, they suddenly called us to come to the reception, pointed out my mistake, and required us to pay additional $50. Although I admit that was my bad, I can't say that was a human treatment. When I visited there, most of their customers were Russian who booked their rooms with all-inclusive plans through their tour agents. If you do so, you may not have so much trouble there. Otherwise, you will have a lot for sure. I stayed for an over night in the hotel. The hotel is somehow close to the airport, however it's far from the activities in Neama Bay but somehow close to Soho Square, so location isn't the best. The rooms are spacious and clean, yet somehow dated; the lock of the room needed to be maintained. Beds are not comfortable at all. The private beach is fine, the pool is good as well and the animation team did many activities. Overall average hotel. 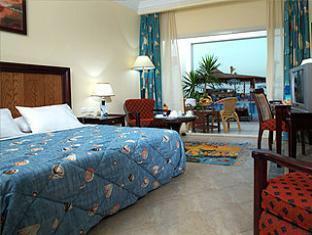 Decent Egyptian 4*+ establishment (does not match the best 5*) for its price I payed at Agoda (per bed & Breakfast). We were quite happy with our 4-day stay at the hotel, especially given the discounted price we payed. I don't know how Agoda manages to sell it for almost 50% less than expedia and the official site rate, but everything went on fine for us. 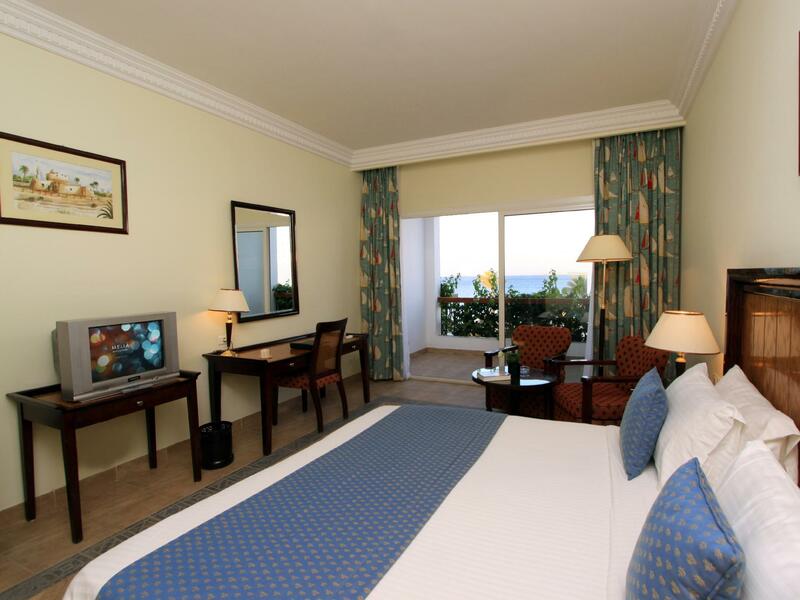 Quite nice territory (big one, with both quiet corners and lively central areas), spotless clean, nice rooms. Nice in house reef as well. Food at breakfast and dinner seemed fine to us as well - good choice and tasty. The only complaint is that some staff (e.g. Barmen) don't pay enough attention to clients - people stay at the counter for a few minutes waiting for those guys finish their chat. Otherwise, they are nice and not annoying. Tès bel acceuil une très belle chambre Tout était prêt lors de notre arrivé Personnel très gentil service du déjeûner était acceptable Cependant une peu de difficulté à se faire servir un café !